Minimum anchors size, what’s the point? There’s a popular idea that anchors should be minimum size, just big enough and no more. The Delta anchor chart (and other brands) greatly underestimates the anchor size. For a 41ft yacht is suggests 10 or 16kg, but definitely not 20 or 25kg. The 51ft Bavaria that dragged into us the other night in Greece only had a 20kg Delta, he said he often drags (like other charter yachts), but the anchor is ok according to the Delta chart. In the 2010 Kings Cup in Thailand, 12 yachts were wrecked on the beach at 5 am, and dozens were damaged by dragging collisions. My 41 ft Beneteau had an oversized 25kg Delta which held firm in the hard sand, the recommended 16kg may have dragged like the rest. That extra 9kg was a good investment! What is the point of a minimum anchor? Is it to save money, or because we used to pull and stow our anchors by hand? On a 40ft+ cruising yacht, it can’t be the weight, we don’t think about the 300kg of water in our bow tanks. The anchor is like a seat-belt in a car, protection against what we hope will never happen. The cruising yachtsman will encounter bad holding and extreme conditions where dragging has serious consequences. Surely we should fit the biggest anchor and chain that we can, and sleep better at night? Re: Minimum anchors size, what’s the point? For the new generation anchors (Rocna, Mantus, Manson) I go one size smaller unless it's at the low end of the chart already. It should be noted that weight reduction is a huge factor in all my decisions. hmmm . . . that is not really a 'popular' concept around here - mostly people here suggest pretty sizable anchors. I had 120lbs anchors on my 47'er. What is the point of a minimum anchor? Generally saving weight, among the racing and day sailing crowd. Weight generally, and specifically on the bow, is terribly bad for racing performance. The anchor is like a seat-belt in a car, protection against what we hope will never happen. Agreed, and anchor tests should be like an auto crash dummy test. I have a next gen anchor and went one size higher than needed. Would have gone 2 sizes higher if it would have fit on the bow. Never drug once set and has only failed to set right off a few times. I'm using a Rocna 10 (22 lbs) on a 35', 15000 lb boat. Works great. I'm all about conservative engineering, but what's the point in a conversation with no engineering basis? The problem is that holding capacity varies by greater than 10x (literally) depending on the bottom. I'd comment, but this is like "how long is a piece of string?" I do have one thought. Why do anchor makers offer a size for "up to 25 knots?" Even a small fishing boat should have something that will hold in a fierce thunderstorm. That is when he will really need it. 50-60 knots is the logical minimum for anyone. Of course, what sort of bottom the recommendations are based on is often another mystery. I guess I'm a moderate. If I raced I'd carry less, and if I cruised full time, I'd carry more. Maybe. I agree with the post, and agree especially that it is a GREAT picture. I wonder where the photographer got such a small Coke can??? Do you know what that chain was attached to? The Super MAX Anchors are sized rather conservatively for a reason. Not sure about other manufacturers. You need an anchor to hold most with conditions turn bad. A nice looking anchor that holds well in 10-15 knot breezes with minimal current action then fails when the conditions become 30-40 knots is not god sizing. We size our anchors for some of the worst conditions. I suspect a number of other new generation anchors also size their anchors accordingly and for severe conditions. Some years ago dragging anchors were a frequent concern in the Bahamas. Today, with the new generation anchors (Rocna, Mantus etc.) its much less of a concern. At one anchorage I was at, a fellow boater attempted to give away his Delta anchor. No takers! I have a 34 ft. sailboat and I use a 45lb. Mantus and I sleep at night! Well, first off, there are people who never anchor overnight. All they need is a lunch hook. As such, it doesn't really make sense for them to spend the money and carry the weight of a bigger anchor. Then, as mentioned, racers want the minimum weight they can get away with. Beyond that, when you talk to people who actually anchor overnight in all kinds of conditions, I don't think you'll find that a minimum anchor is a popular idea at all! "...weight reduction is a huge factor..."
yeah, shipwrecked & no more boat, lightest of all! The 51ft Bavaria that dragged into us the other night in Greece only had a 20kg Delta, he said he often drags (like other charter yachts), but the anchor is ok according to the Delta chart. When we purchased our 45' monohull, it came with a 20Kg Delta. To me, it looked obviously small on the bow. There is some kind of intuitive feeling when it comes to deciding whether an object looks like it might securely hold another, and my mind was saying "no, not always". to a new category in the boating world when your purchase arrives on its own pallet. Amazingly, the Rocna somehow manages to fit on the bow, just, and now the intuitive feeling says "yes, that object will hold the boat object, in virtually any situation". Knock on wood, so far that has proved to be the case. The reassuring "thud" of that thing hitting seabed can literally be heard through the chain. We sleep well. 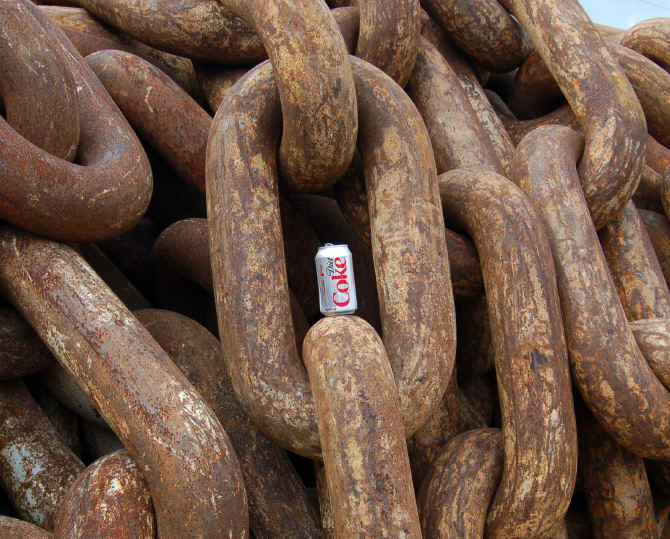 There’s a popular idea that anchors should be minimum size, just big enough and no more…. I’ve never heard of this "popular idea” Rich. The more common theme I hear is to go one one size bigger than recommended. But I suppose it depends on your location, and the type of usage the boats are experiencing. For the bower anchor I always suggest people buy the biggest spade-style anchor their boat and their crew can reasonably manage most of the time. I think your bower should be expected to hold through to force 10 winds or more (50+knots). It makes no sense to me to carry the minimum recommended — unless one never actually anchors, which might be real reason for all those silly undersized Deltas.